Transmissions on the dedicated channel are encoded using a set of paramaters that are picked from a large selection of potential parameters. If the remote station does not know the particular set of parameters that were used by a base station, then the remote station would have to attempt to decode the transmission using every set of parameters, until the transmission is decoded correctly. This is an inefficient methodology. Hence, transmission format information is typically transmitted on a broadcast channel so that a remote station could receive the transmission format information. However, the broadcast channel has reliability problems. New methods and apparatus are presented to allow a base station to determine an overlapping set of Walsh code sequences that can be used to send the transmission format information on the dedicated channel, rather than a broadcast channel. Using the overlapping set allows the remote station to decode the information. Cellular telephone systems configured in accordance with the use of the IS-95 standard employ CDMA signal processing techniques to provide highly efficient and robust cellular telephone service. Exemplary cellular telephone systems configured substantially in accordance with the use of the IS-95 standard are described in U.S. Pat. Nos. 5,103,459 and 4,901,307, which are assigned to the assignee of the present invention and incorporated by reference herein. An exemplary system utilizing CDMA techniques is the cdma2000 ITU-R Radio Transmission Technology (RTT) Candidate Submission (referred to herein as cdma2000), issued by the TIA. The standard for cdma2000 is given in the draft versions of IS-2000 and has been approved by the TIA and 3GPP2. Another CDMA standard is the W-CDMA standard, as embodied in 3 rd Generation Partnership Project “3GPP”, Document Nos. 3G TS 25.211, 3G TS 25.212, 3G TS 25.213, and 3G TS 25.214. In another aspect, a method is presented for ensuring that a remote station receives the transmission format information associated with a transmission on a dedicated channel, comprising: sending a broadcast message containing the transmission format information to the remote station; if a negative acknowledgment is received from the remote station, then: formatting the broadcast message using an overlapping set of Walsh code sequences; and transmitting the re-formatted broadcast message on the dedicated channel to the remote station. FIG. 2 is a diagram of the interaction between signaling layers L 1, L2, L3 in a base station and in a remote station. FIG. 6 is a flowchart illustrating how the Walsh code sequences of a remote station are updated. As illustrated in FIG. 1, a wireless communication network  10 may generally include a plurality of mobile stations (also called remote stations or subscriber units or user equipment) 12 a-12 d, a plurality of base stations (also called base station transceivers (BTSs) or Node B) 14 a-14 c, a base station controller (BSC) (also called radio network controller or packet control function 16), a mobile switching center (MSC) or switch 18, a packet data serving node (PDSN) or internetworking function (IWF) 20, a public switched telephone network (PSTN) 22 (typically a telephone company), and an Internet Protocol (IP) network 24 (typically the Internet). For purposes of simplicity, four mobile stations 12 a-12 d, three base stations 14 a-14 c, one BSC 16, one MSC 18, and one PDSN 20 are shown. It would be understood by those skilled in the art that there could be more or less number of mobile stations 12, base stations 14, BSCs 16, MSCs 18, and PDSNs 20. In one embodiment the wireless communication network  10 is a packet data services network. The mobile stations 12 a-12 d may be any of a number of different types of wireless communication device such as a portable phone, a cellular telephone that is connected to a laptop computer running IP-based, Web-browser applications, a cellular telephone with associated hands-free car kits, a personal data assistant (PDA) running IP-based, Web-browser applications, a wireless communication module incorporated into a portable computer, or a fixed location communication module such as might be found in a wireless local loop or meter reading system. In the most general embodiment, mobile stations may be any type of communication unit. The mobile stations  12 a-12 d may be configured to perform one or more wireless packet data protocols such as described in, for example, the EIA/TIA/IS-707 standard. In a particular embodiment, the mobile stations 12 a-12 d generate IP packets destined for the IP network 24 and encapsulate the IP packets into frames using a point-to-point protocol (PPP). In one embodiment the IP network  24 is coupled to the PDSN 20, the PDSN 20 is coupled to the MSC 18, the MSC is coupled to the BSC 16 and the PSTN 22, and the BSC 16 is coupled to the base stations 14 a-14 c, via wirelines configured for transmission of voice and/or data packets in accordance with any of several known protocols including, e.g., E1, T1, Asynchronous Transfer Mode (ATM), IP, PPP, Frame Relay, HDSL, ADSL, or xDSL. In an alternate embodiment, the BSC 16 can be coupled directly to the PDSN 20. During typical operation of the wireless communication network  10, the base stations 14 a-14 c, receive and demodulate sets of reverse signals from various mobile stations 12 a-12 d engaged in telephone calls, Web browsing, or other data communications. Each reverse signal received by a given base station 14 a-14 c, is processed within that base station 14 a-14 c. Each base station 14 a-14 c, may communicate with a plurality of mobile stations 12 a-12 d by modulating and transmitting sets of forward signals to the mobile stations 12 a-12 d. For example, as shown in FIG. 1, the base station 14 a communicates with first and second mobile stations 12 a, 12 b simultaneously, and the base station 14 c communicates with third and fourth mobile stations 12 c, 12 d simultaneously. The resulting packets are forwarded to the BSC 16, which provides call resource allocation and mobility management functionality including the orchestration of soft handoffs of a call for a particular mobile station 12 a-12 d from one base station 14 a-14 c, to another base station 14 a-14 c. For example, a mobile station 12 c is communicating with two base stations 14 b, 14 c simultaneously. Eventually, when the mobile station 12 c moves far enough away from one of the base stations 14 c, the call will be handed off to the other base station 14 b. If the transmission is a conventional telephone call, the BSC  16 will route the received data to the MSC 18, which provides additional routing services for interface with the PSTN 22. If the transmission is a packet-based transmission such as a data call destined for the IP network 24, the MSC 18 will route the data packets to the PDSN 20, which will send the packets to the IP network 24. Alternatively, the BSC 16 will route the packets directly to the PDSN 20, which sends the packets to the IP network 24. As is known in the art, layering is a method for organizing communication protocols in well-defined encapsulated data units between otherwise de-coupled processing entities, i.e., layers. FIG. 2 illustrates three protocol layers L 1 220, L2 210, and L3 200 implemented in both a base station 250 and a remote station 260. Layer L1 220 provides for the transmission and reception of radio signals between the base station and remote station, layer L2 210 provides for the correct transmission and reception of signaling messages, and layer L3 200 provides for the control messaging for the communication system. Layer L3 200 originates and terminates signaling messages according to the semantics and timing of the communication protocol between the base station 250 and the remote station 260. In a cdma2000 system, L1 is referred to as the Physical Layer, L2 is referred to as the Link Access Control (LAC) Layer or the Medium Access Control (MAC) Layer, and L3 is referred to as the Signaling Layer. On top of Signaling Layer is the Application Layer 230, which contains functions for particular application services. At layer L 3 200, voice traffic 201, packet data traffic 203, and system services 205 are conveyed via data units constructed in accordance with the standards discussed previously. The transmission parameters, such as the Walsh space information, are processed at layer L3. For cdma2000 systems, the Walsh space information is communicated from a base station to a remote station by the use of three layer L3 messages, which are referred to herein as the Walsh Table ID message, the Walsh Mask message, and the Last Walsh Code indicator message. The Walsh Table ID message is used to identify one of a plurality of Walsh tables, wherein each table lists indices of Walsh codes that are available for establishing a packet data channel between the base station and the remote station. 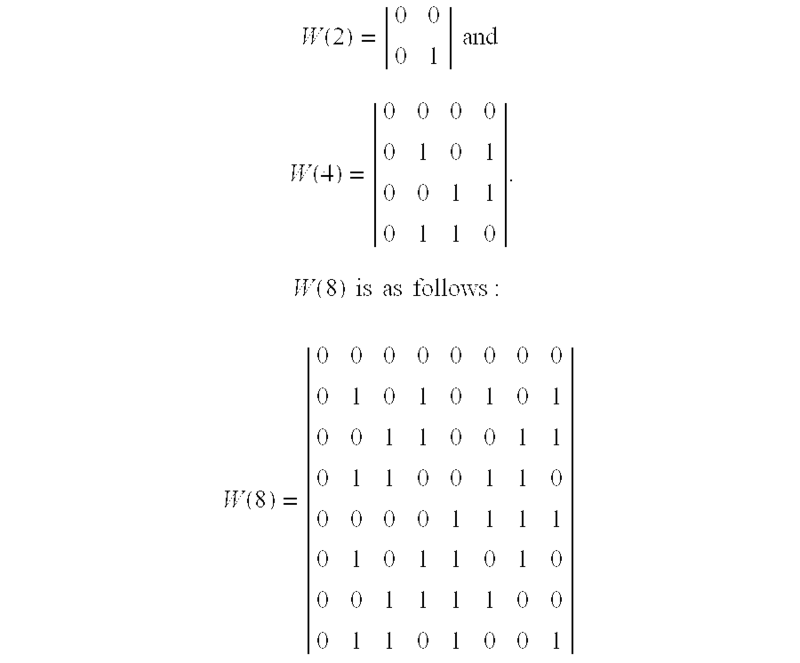 The indices can further be stored as a function of a particular order of use, i.e., the order of the indices indicates that a particular Walsh code sequence is to be used before other Walsh code sequences. FIG. 3 illustrates the methodology of obtaining Walsh space information for a F-PDCH. Section  300 illustrates the various Walsh tables 301A, 301B, . . . 301N stored both at the base station and the remote station. A Walsh Table ID message, a Walsh Mask message, and a Last Walsh Code Indicator message are transmitted by the base station to the remote station. Section 310 illustrates the overlay of the mask 311 defined by the Walsh Mask message with the table 301 i identified by the Walsh Table ID message. In FIG. 3, the mask 311 is represented by a sequence of “0”s and “1”s, which are then multiplied to the table 301 i, wherein multiplication with the “0”s means that the corresponding sequence in the table 301 i is not available for use. The overlay of the mask 311 produces a set 321 of Walsh codes in Section 320 that will be used for dedicated communications between the base station and the remote station. Section 320 further illustrates the index of the last Walsh codes used for the corresponding F-PDCH using LWCI information 322, 323. FIG. 4 describes the generation of an acknowledgment to a broadcast transmission using a new Acknowledgment Channel, which is described in more detail below for FIG. 5B. A processor and memory element is configured in a base station to perform the method steps described in FIG. 4. Alternatively, other infrastructure elements can be configured to perform the steps. The embodiment comprises the implementation of both program flows described by blocks  4A and 4B. At step 400, a system flag is set in a remote station as to whether acknowledgments to a broadcast transmission must be generated. In this embodiment, the broadcast transmission is a Walsh Mask message. At step  410 of block 4A, the remote station receives a Walsh Mask message and compares the newly received Walsh Mask to an old Walsh Mask stored at the remote station. If the received Walsh Mask message is the same as the old Walsh Mask message, then at step 420, the remote station refrains from transmitting the acknowledgment. In one embodiment, if the remote station has previously acknowledged the old Walsh Mask message, then remote station can be configured to repeat the acknowledgement. If the received Walsh Mask message is different from the old Walsh Mask message and the conditions described in block 4B are met, then at step 430, the remote station transmits an acknowledgment on the reverse link acknowledgement channel described in FIG. 5B. At step  450 of block 4B, the remote station determines whether a transmission on the F-PDCH was scheduled at the same duration as a Walsh Mask message on the F-PDCCH. If not, then at step 460, the remote station refrains from transmitting the acknowledgment. If so and the conditions of block 4A are met, then at step 470, the remote station transmits an acknowledgment on the reverse link acknowledgement channel described in FIG. 5B. FIG. 5A is an example of a prior art acknowledgment channel structure for acknowledging messages received on dedicated channels. A remote station (not shown) generates one bit, either 0 or 1, for each slot to indicate whether a subpacket has been accurately decoded or not. A “slot” is a duration of time and a “subpacket” is a transmission unit. A message can be transmitted as one or as a plurality of subpackets over at least one slot period. The bit is repeated a plurality of times in a repetition element  500. In a system that transmits at a rate of 1.2288 megachips per second (Mcps), an optimal repetition factor is twenty-four (24). The term “chip” is used to describe a bit in a spread sequence, such as a bit pattern spread by a Walsh code. The output of the repetition element 500 is mapped by a mapping element 510 to either +1 or −1. The output of the mapping element 510 is covered by a spreading element 520. In one embodiment, the spreading element 520 can be a multiplier that spreads the mapping output by an ith 64-ary Walsh code sequence. FIG. 5B is a block diagram of a channel structure for a new Reverse Link Acknowledgement Channel (R-ACKCH) for acknowledging transmissions sent on a dedicated packet channel, and for acknowledging transmissions sent on a broadcast channel. Reverse Acknowledgment Channel bits  550 for the dedicated channels are input into repetition element 560 at repetition factor RF=3×ACKCH_REPSs, wherein ACKCH_REPSs is a system defined constant of 1, 2, or 4. In one embodiment, the number of Reverse Acknowledgment Channel Bits are generated according to the rule of 1 bit per ACKCH_REPSs over a 1.25 ms slot. The output of the repetition element 560 is 3 symbols per slot. Reverse Acknowledgment Channel bits 555 for transmissions received on the broadcast channels are input into covering element 570. The Reverse Acknowledgement Channel bits 555 are used by the covering element 570 to select a Walsh code sequence. The selected Walsh code sequence comprises 8 symbols per slot, which covers the output of the repetition element 560 by the use of a multiplier 580 to form 24 symbols per slot. Using slots of duration 1.25 ms, the output of the multiplier is generated at a rate of 19 kilo-symbols per second (ksps). The output is then sent to be modulated, upconverted and transmitted over-the-air, the details of which are not discussed herein. FIG. 6 is a flowchart for exchanging L3 signaling messages that contain current transmission format information. At step  600, the remote station determines that a recently received transmission on a dedicated channel could not be properly decoded, indicating that a wrong Walsh mask, Walsh table, or LWCI was used. At step 610, the remote station generates a Walsh Mask Request Message or a Walsh Table ID Request Message or a LWCI Request Message, whichever is appropriate, and transmits said message to a serving base station. At step 620, the serving base station receives said message and sends a Walsh Mask Update Message or a Walsh Table ID Update Message or a LWCI Update Message to the remote station, whichever update response is an appropriate reply to said message. At step 630, the remote station receives said update response and updates the Walsh code sequences. Note that the update Walsh information update messages can be sent autonomously by the base station, i.e., without a corresponding request from the remote station. Alternatively, the actual common MAC_ID itself could be used as the counter reset value. For example, in a cdma2000 system, the MAC_ID values 0-7 are designated as common amongst all remote stations operating within the range of a serving base station. Hence, if MAC_ID value 6 is transmitted on the broadcast channel, all the remote stations would be configured to decode the message attached to this MAC_ID. In one embodiment, if a 3-bit counter is used at both the base station and the remote station, then 2 3=8 values need to be conveyed to the remote stations. If the value of the local counter is used to pick the value of the MAC_ID, then the need for a separate reset command message is eliminated. The MAC_ID would serve a dual purpose; first, the original purpose of specifying that an attached message is for all remote stations, and second, the purpose of identifying a counter value. sending the message on the dedicated channel using the overlapping set of Walsh code sequences. transmitting the re-formatted broadcast message on the dedicated channel to the remote station. means for sending the message on the dedicated channel using the overlapping set of Walsh code sequences. ES2324296T3 (en) 2009-08-04 Operating an acknowledgment channel direct link for reverse link data.